"Moon River" is a song composed by Henry Mancini with lyrics by Johnny Mercer. It was originally performed by Audrey Hepburn in the 1961 movie Breakfast at Tiffany's. Andy Williams first recorded it in 1962. 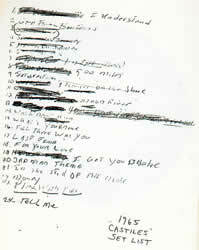 Mercer and Mancini wrote the song for Audrey Hepburn to sing in the film Breakfast at Tiffany's. The lyrics, written by Mercer, are reminiscent of his childhood in Savannah, Georgia, including its waterways. As a child, he had picked huckleberries in summer, and connected them with a carefree childhood and Mark Twain's Huckleberry Finn. Although an instrumental version is played over the film's opening titles, the lyrics are first heard in a scene where Paul "Fred" Varjak (George Peppard) discovers Holly Golightly (Hepburn) singing the song, and accompanying herself on the guitar, while sitting on the fire escape outside their apartments. There was an eruption of behind-the-scenes consternation when a Paramount Pictures executive, Martin Rackin, suggested removing the song from the film after a tepid Los Angeles preview. Hepburn's reaction was described by Mancini and others in degrees varying from her saying, "Over my dead body!" to her using more colorful language to make the same point. Andy Williams first recorded it in 1962. 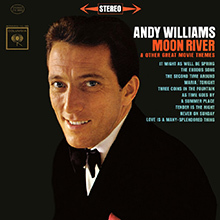 Although Andy Williams never released the song as a single, his LP Moon River and Other Great Movie Themes (1962), was certified gold in 1963 for selling one million units.